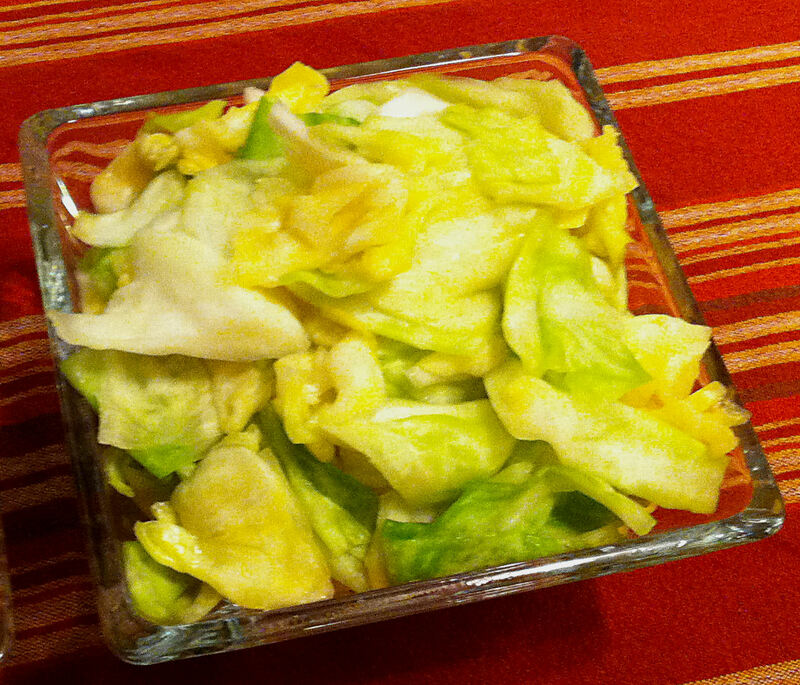 He made this dish with Western green cabbage, not the usual Asian Napa cabbage. I knew that he had the recipe just right, because it tasted just like the tsukemono served in the Japanese restaurants in the LA area. It was salty and squeaky-crunchy and one of the delights of my childhood. We all could not wait for him to make another batch. Many modern salt cabbage recipes try to limit the amount of salt used in pickling and then rinse off the “excess salt” after pickling. This is intended to make the pickles more “healthy.” However, it produces lackluster, flabby, tasteless pickled cabbage. A “good” amount of salt is needed to make these pickles taste “just right.” Recent studies have shown that salt is not as connected to high blood pressure as was previously thought. This does not mean that you should eat a whole plate of these salty delights, but a few are not going to kill you. 4. Toss the vegetables several times over the next hour to coat all surfaces of the cabbage. Tip: This hour starts the process of drawing the liquid out of the leaves and makes them a bit softer and easier to press down. 5. Wipe the kombu with a damp towel and put it in the bottom of a pickle press. 6. Transfer the cabbage, and any liquid, to the pickle press and add a tablespoon or two of water. Tip: You want the cabbage to be completely submerged whey it is press down, but you do not want to dilute the brine too much. My dad used to pickle all the time. He had a refrigerator dedicated to his pickles in the basement!